When we were little our mum (Australian spelling!) would take us to a local bakery called “Meddy’s Cake Shop” down in North Bondi. Meddy’s was a very traditional european style bakery that you don’t see much of these days. Even back when I was a kid, the place looked so old! I’m pretty confident it was there long before I was born. But the stuff that came out of that bakery smelled and looked amazing. This wasn’t an every week kind of visit but it was a fairly regular event. We’d either be there picking up a Kugelhopf cake for Shabbat dinner dessert OR (and this I remember very well) we would each be given a special treat to eat while we waited patiently for my mum to get her hair done at the hairdresser next door to the bakery. My brother would always get a cheese pocket pastry and I would get one delicious cupcake. This isn’t the kind of cupcake that we have these days with rich buttercream frosting. This was a simple cupcake consisting of yellow sponge, some kind of jam layer, topped with a basic dark colored glace icing, sprinkled with hundreds and thousands. For me, it was heaven. That sugary icing combined with the fruity jam spread was something to be conserved. You’d want to make sure every cupcake bite had the perfect ratio of icing, jam and sponge. And so, I endeavored to recreate these cupcakes. 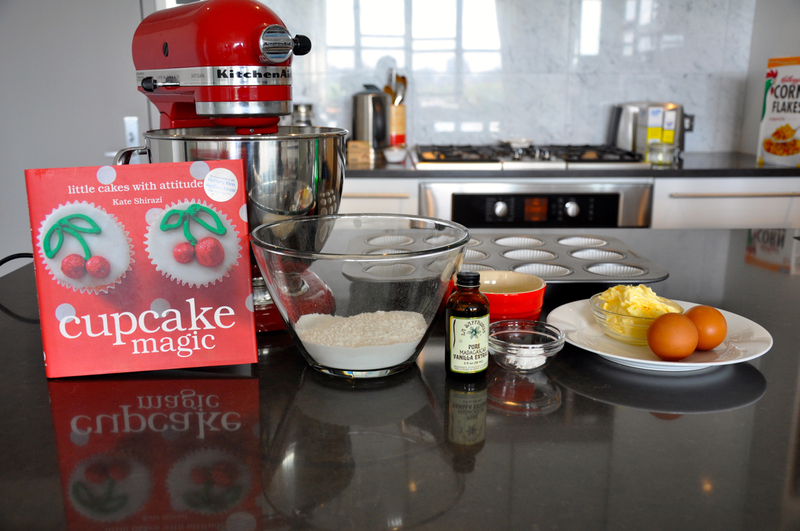 I followed a basic recipe for the cupcake batter and glace icing from Kate Shirazi’s “Cupcake Magic”. I baked the cupcakes and let them cool completely before spreading a very thin layer of strawberry jam on top followed by a very interesting black colored glace icing. I have to say I really struggled with the icing. I managed to nail the consistency but the color was a whole other story. No matter how much black food coloring I added, the icing just stayed a miserable gray. I really went to town with the food coloring this time around to get it a little darker but I think that next time I won’t try so hard. I’m sure you can tell that I think of these cupcakes very fondly and have tried to recreate them over the years. This most recent attempt would have to be my most successful. The look, taste and consistency were all pretty close to what I remember having as a kid. It’s so nice to be able to recreate these happy food memories 25 years later! 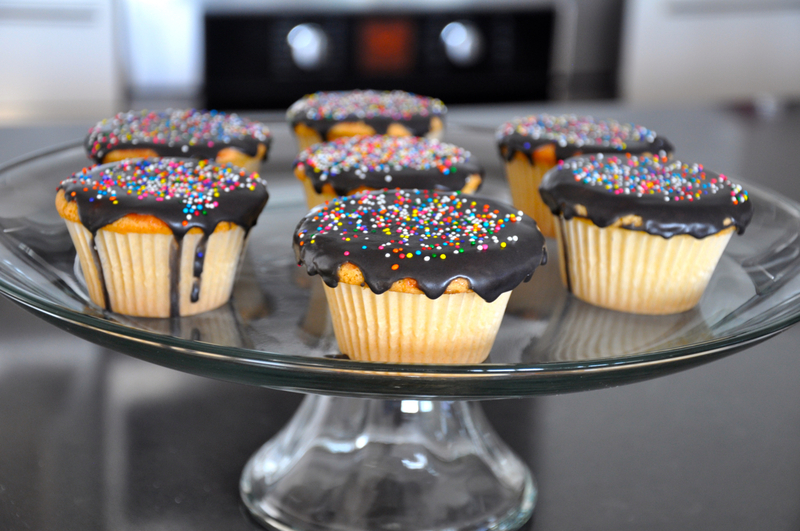 Cupcakes from my childhood – Adapted from basic low-faff cupcake recipe by Kate Shirazi. 110g/4oz/0.5 cup caster (superfine) sugar. 200g/7oz/1.25 cups icing (confectioners’) sugar, sifted. Preheat the oven to to 160 degrees C / 325 degrees F.
Put all the ingredients (except for icing ingredients) in a food processor or a large bowl. Mix together until batter is light and fluffy. 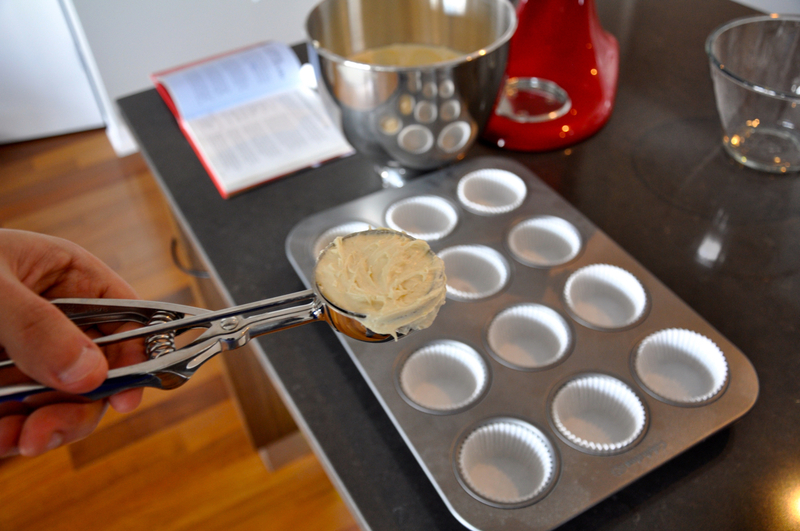 Use an ice cream scoop to measure equal amounts of batter into the cupcake cases. Baked in the over for about 20 minute until golden, and firm and springy when you prod. 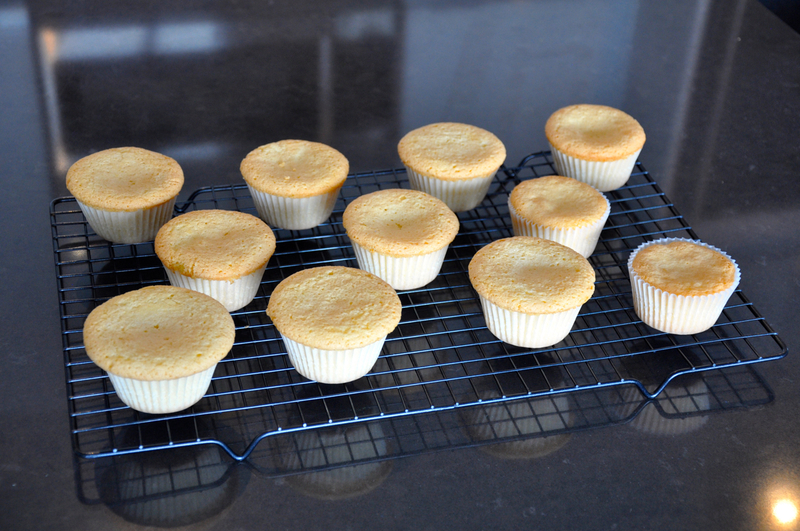 Let cupcakes sit in tin for 5 minutes before removing to a wire rack to cool completely. 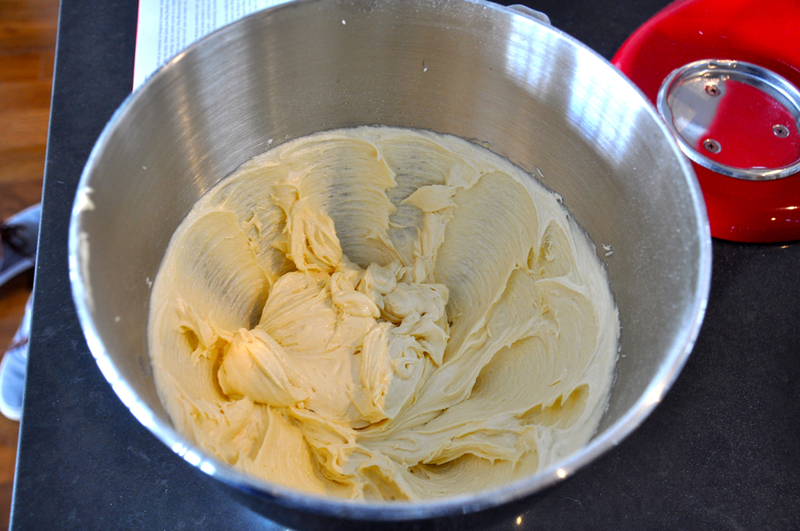 Slowly add the water to the sugar and stir until youhave a consistency like thick cream. Slowly add the food coloring, stirring in between additions till you achieve the desired color. Heat a small cup of strawberry jam in the microwave for about 30 seconds. 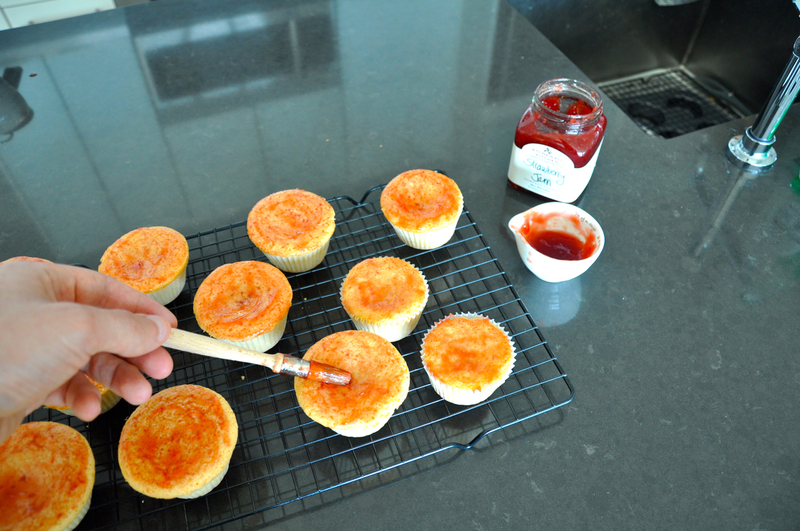 Using a brush, put a thin layer of jam on each cupcake. 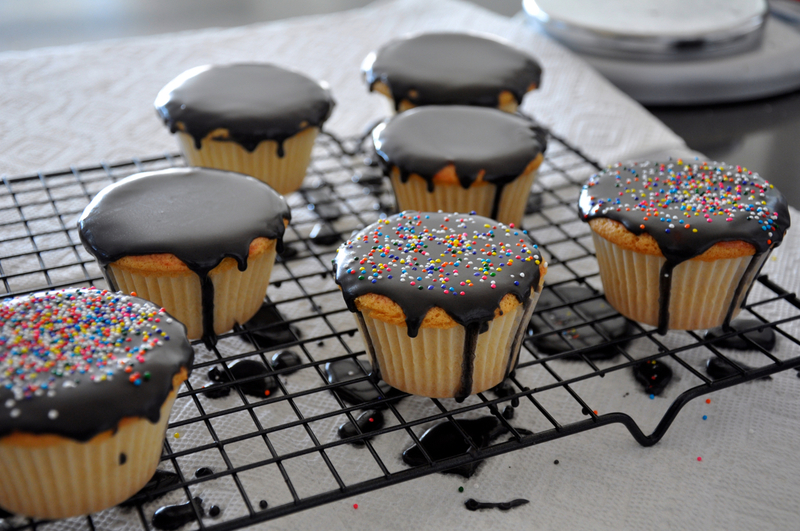 Drizzle the icing sugar onto each cupcake using a spoon or measuring cup. If using a spoon, try not to make direct contact between the spoon and the cupcake so as to avoid “mixing” the jam and icing together. You want clearly differentiated layers here. You are so good you bring tears to my eyes the way you write is so nice. wow! they look exactly the same! i loved them too i thought they would have used melted chocolate as the icing though?